The King Arthur Flour Baker's Companion. Make sure your eggs are separated. Using a large mixing bowl, add the egg whites and the cream of tartar. Mix until soft peaks are formed, then set aside. Add the sugar and beat until the mix becomes thick. add the dry ingredients that you set aside earlier. gently whisk them in to the mix. 12 small bundt cakes, or 6 bundt cakes and a 9"x9" cake. Bake the bundt cakes for 20-25 muinutes. 15 minutes, before removing them from the pan. a baking dish such as an 8"x11" size. and on the sides, all the way to the bottom, and all around. can soak up all the moisture. In a small bowl mix together the meringue powder and water. and add the salt. Mix until soft peaks form. saucepan and over medium heat bring the pan to a boil. Cover the pan for 4 minutes, and let the mix boil. Uncover and boil until a candy thermometer reads 240 degrees. Remove the pan from the heat right away. to get a glossy, thick, pretty look to your frosting. Wilton 1M tip. Decorate how you would like. strawberry in the center of your cake. Oh yum! These look so good. 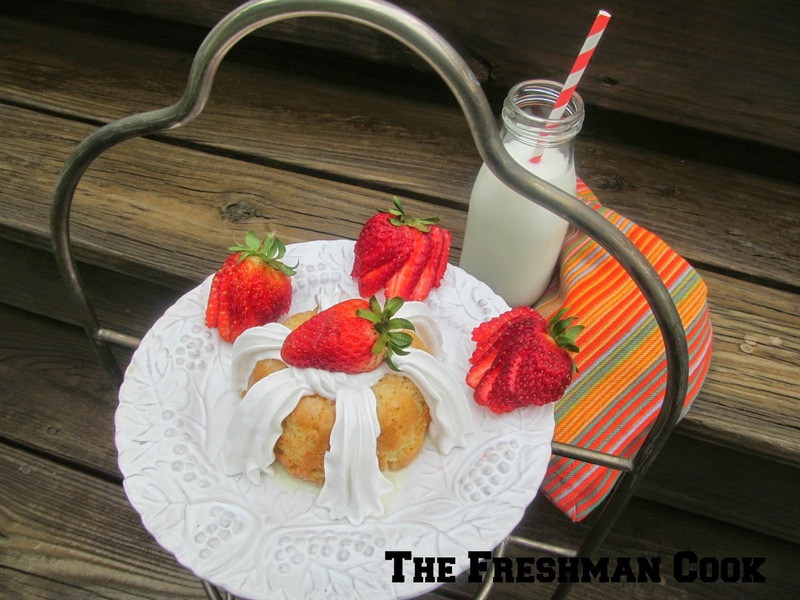 I love tres leches and the mini bundt cakes are such a fun way to serve it! I've never made a bundt cake. One of these days I am going to have to up my baking skills and give it a try. Chrystal @ YUMeating.com Thanks for linking up at The Yuck Stops Here!